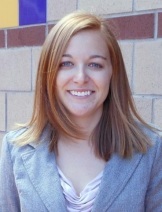 Kristin Roher received a 2012 Eugene Cota-Robles (ECR) Fellowship, awarded by the UC Irvine Graduate Division. Considered the most prestigious diversity fellowship offered at UCI, the ECR is named in honor of one of the earliest Mexican-American professors in the University of California. The fellowship is designed to increase the number of qualified candidates for faculty positions within the UC; it places students interested in careers in academic teaching and research on a fast track toward achieving their doctoral degree. I grew up in town called Lewisberry, just outside of Harrisburg, Pa.
B.S. in computer engineering from the University of Pittsburgh. My advisor at Pitt recommended that I check out UCI because he knew Professor Debra Richardson (now my advisor) from when he was in graduate school. He said her interests seem to be in line with mine, and he was right. I also really wanted to go somewhere in California for the warm weather. What is your current research focus? Why did you choose to go into this field of study? I plan to stay in academia because I like the flexibility that it will offer in terms of the research I’ll be doing. I enjoy swimming, biking, hiking, wine tasting and hanging out with friends.